– Burmese Army heavy machine gun. 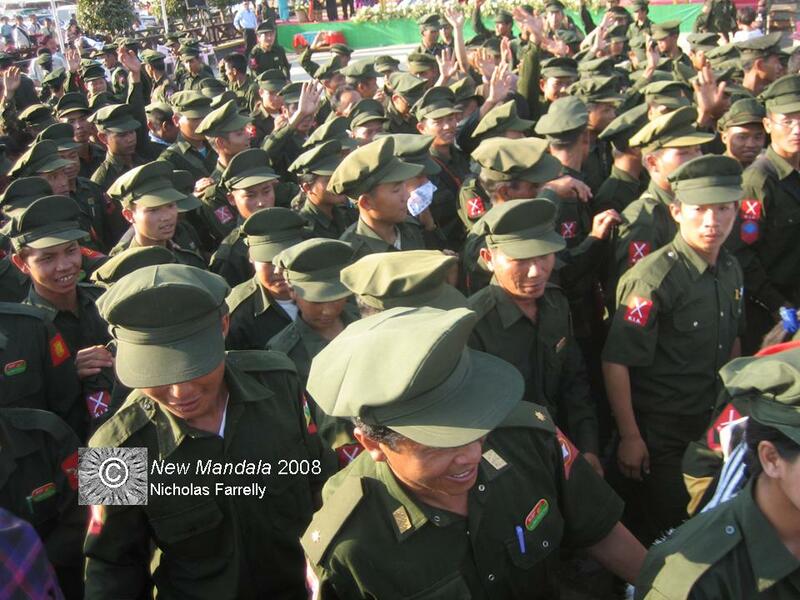 Part of the security detail that accompanied the Burmese Army’s Northern Commander to the Manau. 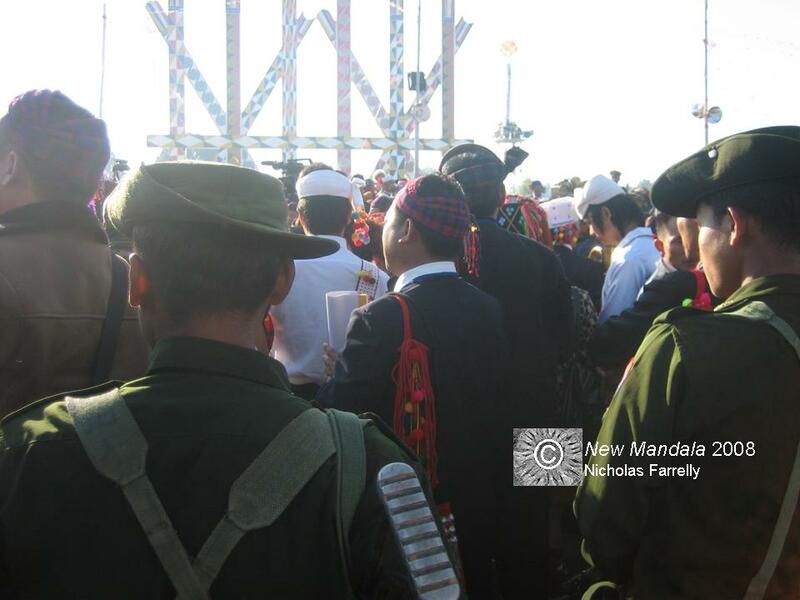 The Manau festival marking the 60th Anniversary of the Kachin State was a significant event for everyone who is jockeying to decide the future of northern Burma. 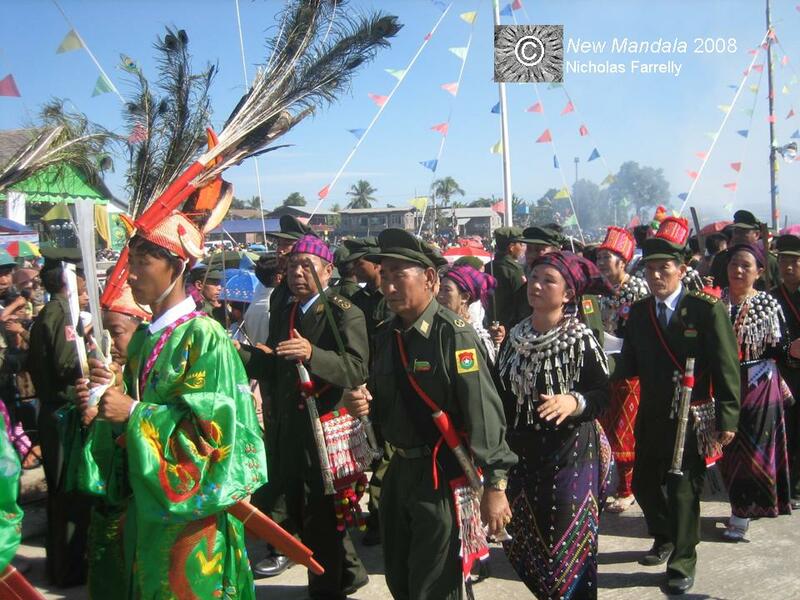 Under the current ceasefires in the Kachin State this Manau festival was exceptional. It is rare to have each of the major Kachin armed groups in the state and the Burmese Army all together at the one event. 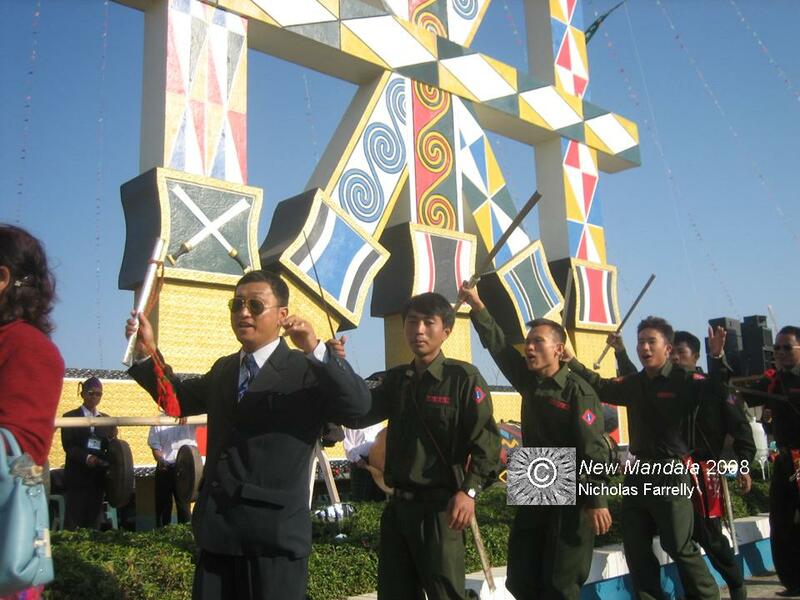 To begin the more substantial posts in my series on the recent Manau festival held in Myitkyina, Kachin State, I have put together some pictures that highlight the prominent roles of the various armed groups. Armed groups – whether they wear government uniforms or have other allegiances – are a fact of life in northern Burma. This should not be taken to imply that every activity is dominated or defined by weapons. But the Myitkyina Manau was a special example that highlighted the ways that various armed groups (including the Burmese military government) seek to assert their position. In this post I will present some images from the Manau festival. They highlight the presence of the Kachin Independence Army/Organization (KIA/O), the New Democratic Army – Kachin (NDA-K) and, of course, the Burmese tatmadaw. With the exception of the Burmese soldiers, most other troops that are pictured here are not carrying firearms. Readers who are new to the politics of this region may find the pictures presented here somewhat bewildering. I have, for that reason, provided a number of links to relevant material that may help to clarify the history and context of each group that is on show. 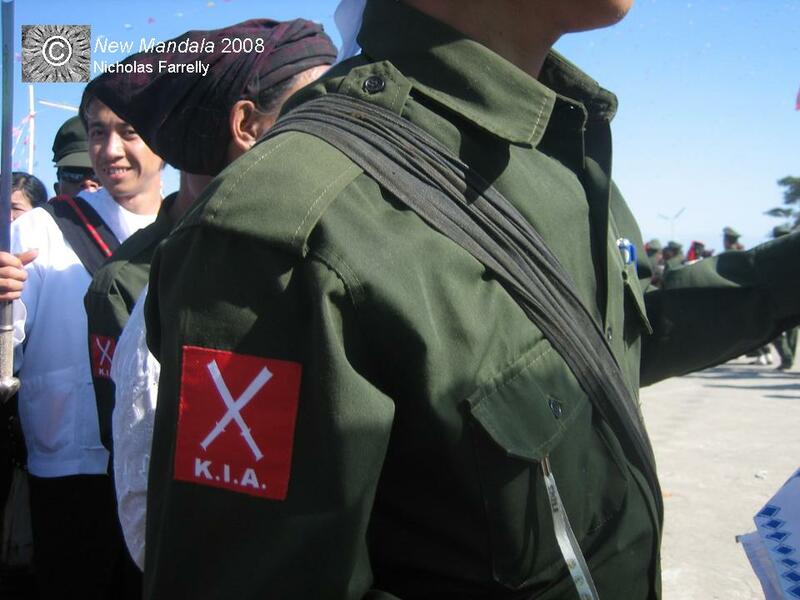 – The distinctive shoulder patch worn by Kachin Independence Army troops. The Lasang Awng Wa group, discussed in a previous post, still tends to wear what are basically KIA uniforms. This can create some initial confusion about which is the “mother army” and which is the “splinter group”. 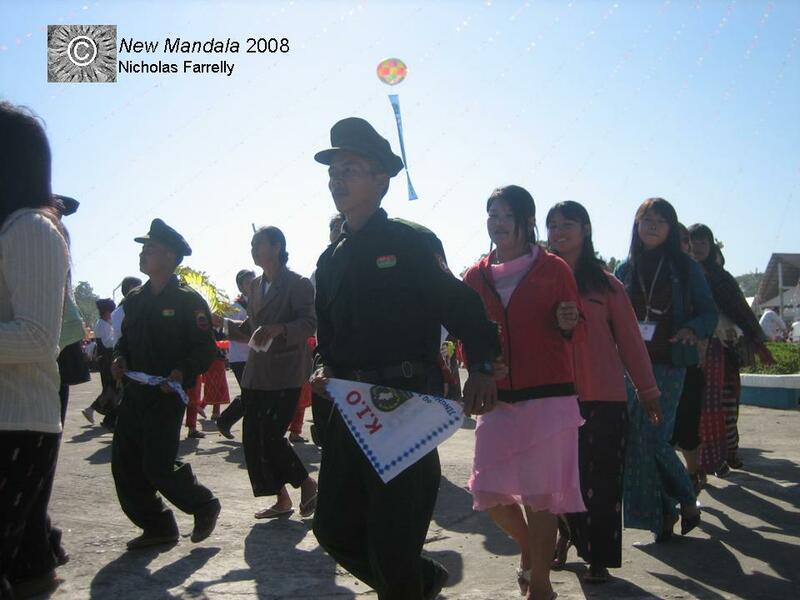 – KIA/O leadership dancing in the middle of the day on 10 January 2008. – Armed KIA bodyguards keep a careful eye on everyone as their commanders dance around the Manau poles. – A KIA soldier dancing with a KIO scarf. 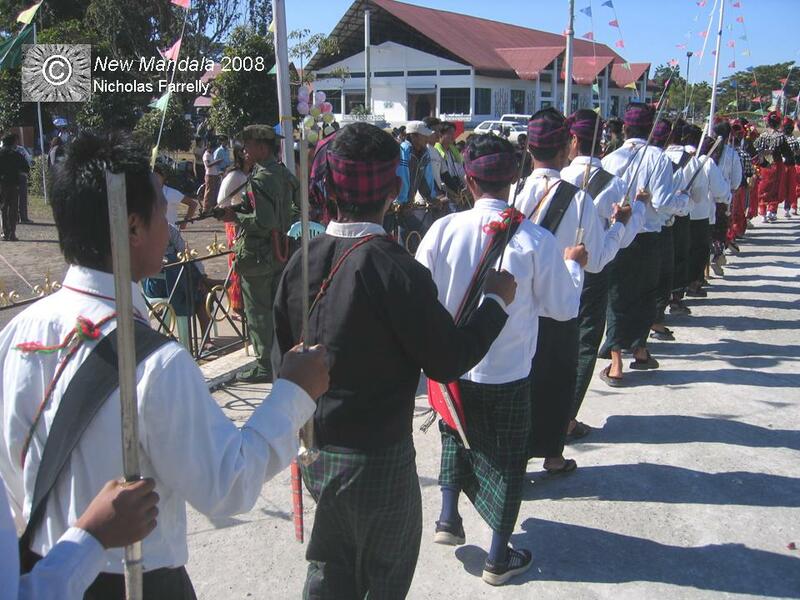 – Hundreds of Kachin soldiers prepare to depart the Manau festival for their base at Laiza. They are given an emotional good-bye from the huge Kachin crowd that assembled to see them off. 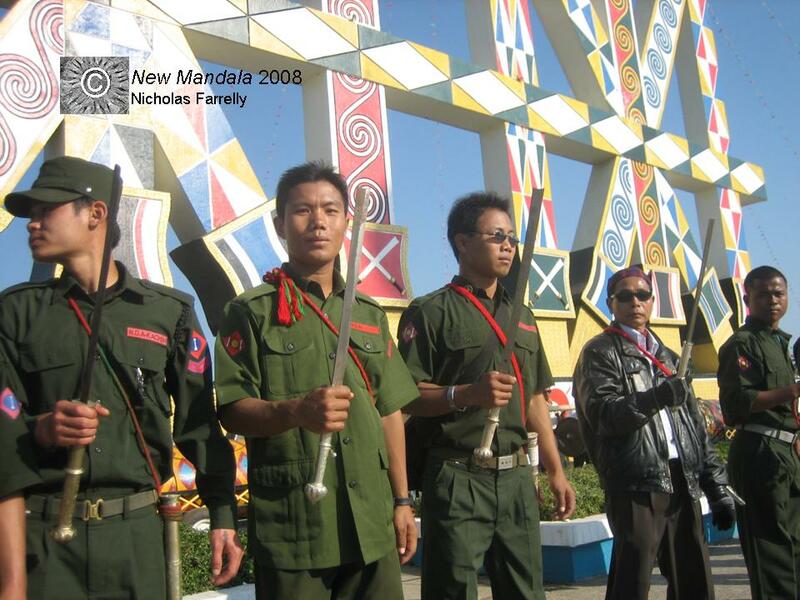 – New Democratic Army – Kachin soldiers dancing in front of the Manau poles. – NDA – K soldiers giving a cheer. – The Chairman of the New Democratic Army – Kachin, Zahkung Ting Ying, flanked by bodyguards, makes his way to be greeted by some of Myitkyina’s senior business, cultural and political figures. 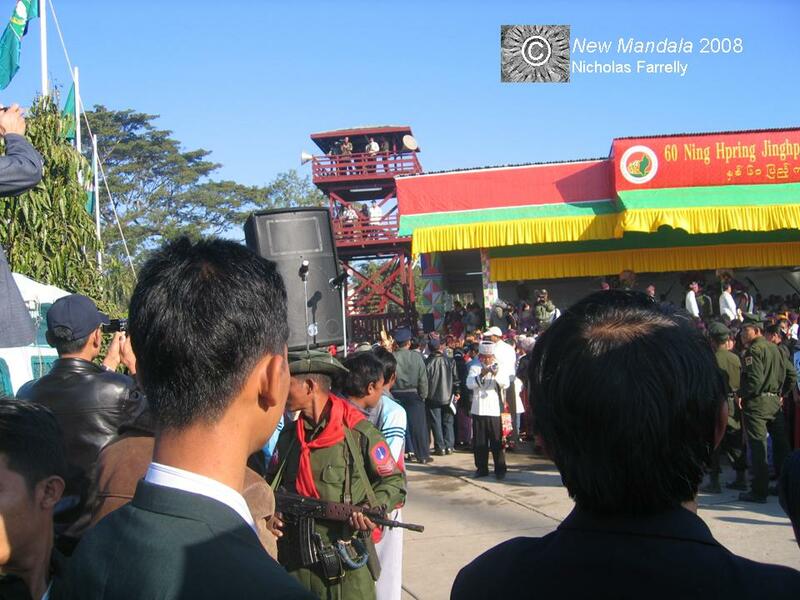 – On the outer ring of the Manau ground a Burmese soldier eyes the small crowd. – This picture takes in Burmese soldiers from the personal bodyguard of the Northern Commander and a number of men in the tracksuits worn by Union Solidarity and Development Association members. 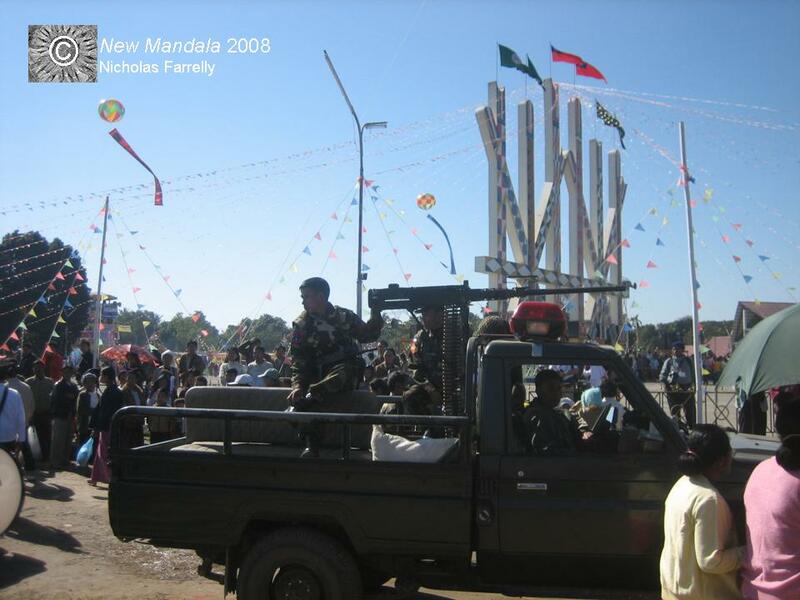 On the major Manau day, 10 January 2008, these men provided extra security for the Northern Commander and his delegation. Some appeared to be armed. – The scene as the Northern Commander and other senior figures took their position on a stage. 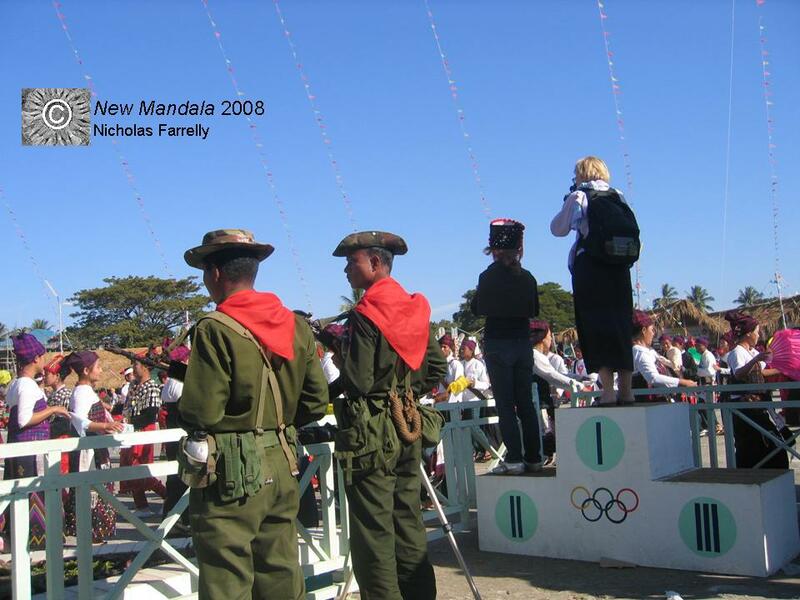 The tower in the background was used by Burmese soldiers throughout the Manau to keep a close watch on the crowds from above. 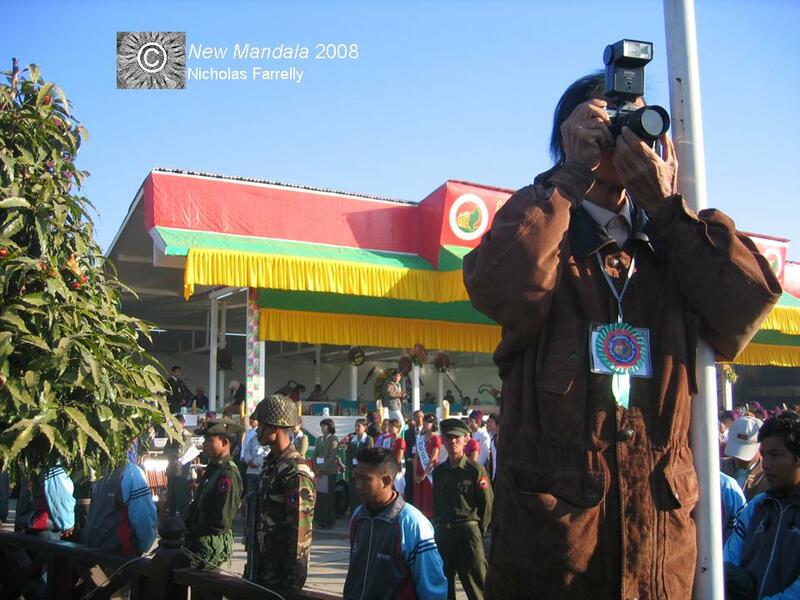 – Throughout the festival the Burmese military had a strong presence on the ground. It was only during the dance by the KIA/O that they appeared to evaporate. 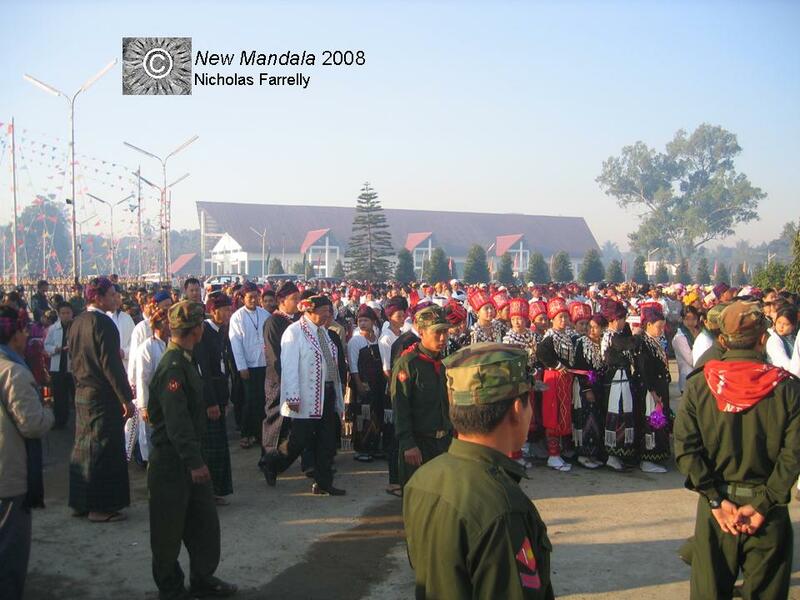 – These Burmese troops were standing guard over the dancing on 10 January 2008. They are right in the middle of the the Manau ground. Up on the “Olympic” podium are two westerners snapping pictures. 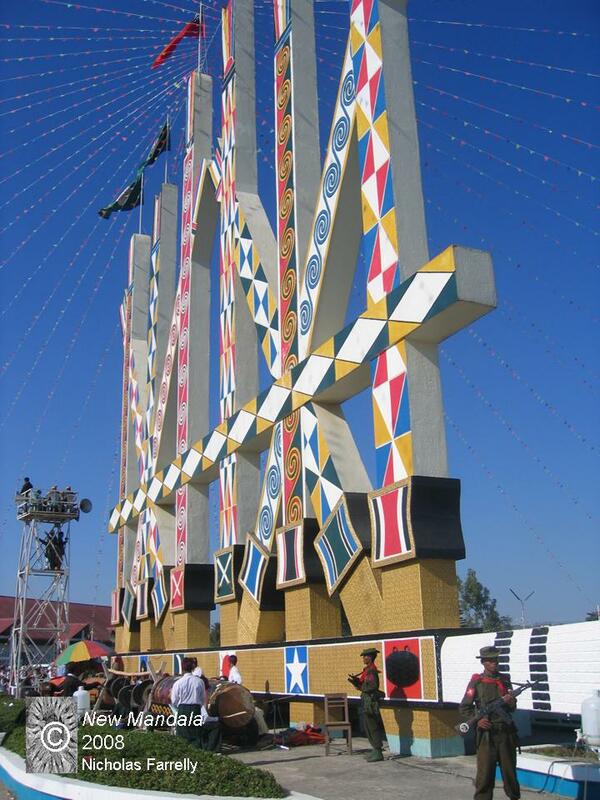 – Burmese troops stationed right in front of the Manau poles, the most prominent symbol of Kachin unity and culture. – Major-General Ohn Myint, Chairman of the Kachin State Peace and Development Council and Commander of the Burmese Armed Forces’ Northern Command, in chiefly regalia. He is surrounded by women from prominent Myitkyina families, including his own. He wore this “Kachin” jacket, sword and hat for about 30 minutes. He then reverted to his military uniform. – Later in the day the Northern Commander visited the hospitality tent where a band played for his enjoyment. Although I failed to capture the moment for posterity he handed over a very large wad of kyat to the band-master to show his appreciation. I have hundreds of other photographs that capture telling moments from the Manau festival. Over the next week I plan to post more of this material to New Mandala. It was a huge event and I cannot do justice to the diversity of happenings in just one or two posts. For that reason I am particularly happy to answer any questions from readers. If there are elements of the festival, or the wider Kachin context, that you would like to see clarified then please do not hesitate to post a comment. Thanks for the nice photos. I’ll be amazed if this actually makes it through since every comment to this blog for the last week has been dropped. Thanks Jon – sorry to hear that comments have been dropped. Sorry for the disruptions. Please let me know if there is anything we can do to help. And, Grasshopper, thanks for your question – as you suggest it is hard to say definitively. Of course, the senior Burmese Army contingent (which included a few other generals) had a number of engagements with the high and mighty from the Kachin side. This is not surprising. Many on all (elite) sides of the current ceasefire “divide” work closely together on a range of issues. But I think your question is more about “ordinary” contacts between the Burmese Army and the Kachin. 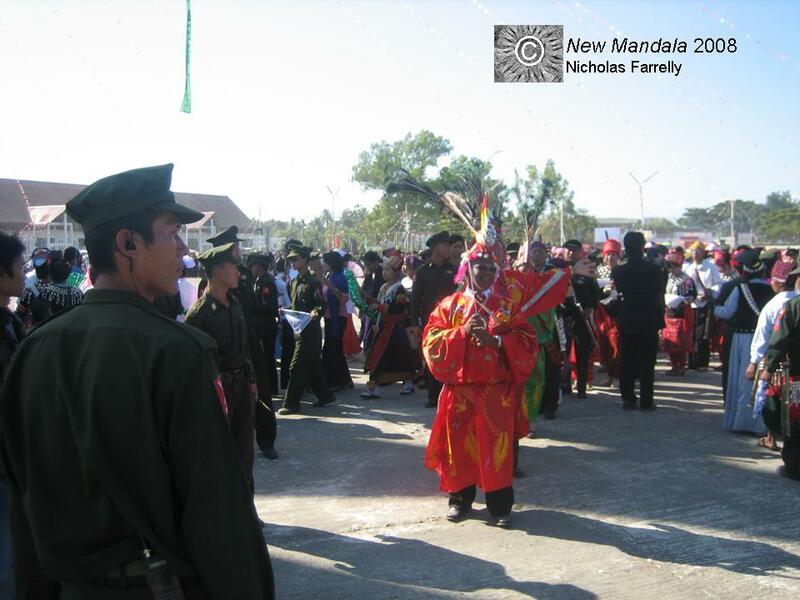 From what I saw and heard around the Manau there was no great appreciation for the Burmese Army presence. They are tolerated, perhaps only because they are so heavily armed. This is not really an exceptional situation. In fact, from what I saw, many of the Burmese soldiers didn’t expect to be greeted warmly. They know the score. The BNI (Kachin News Group) report is certainly one interpretation of what happened. In this series of posts I hope to show a number of other aspects of the festival. The Manau was tense – there is no question about that. I also hope to clarify some of those tensions in coming posts. But if you have more questions before then, please feel free to ask. If I’m not mistaken the Northern Commander is wearing Rawang chiefly regalia. I wonder if he got it from the Rawang militias he’s been organizing. Interesting choice of attire. Just to further complicate matters, there is also a picture of Kachin jade and timber tycoon, Sutdu Yup Zau Hkawng, on the front page of 2008’s Jinghpaw Mungdaw Nsen (Vol.1, No.2), that has him wearing a very similiar (the same?) outfit. Yup Zau Hkawng is, as far as I know, not Rawang…not even close. Of course the outfit worn from time-to-time by both the Northern Commander and Yup Zau Hkawng is a particularly impressive one. Does that explain why it is used in this way? Or is it (now?) 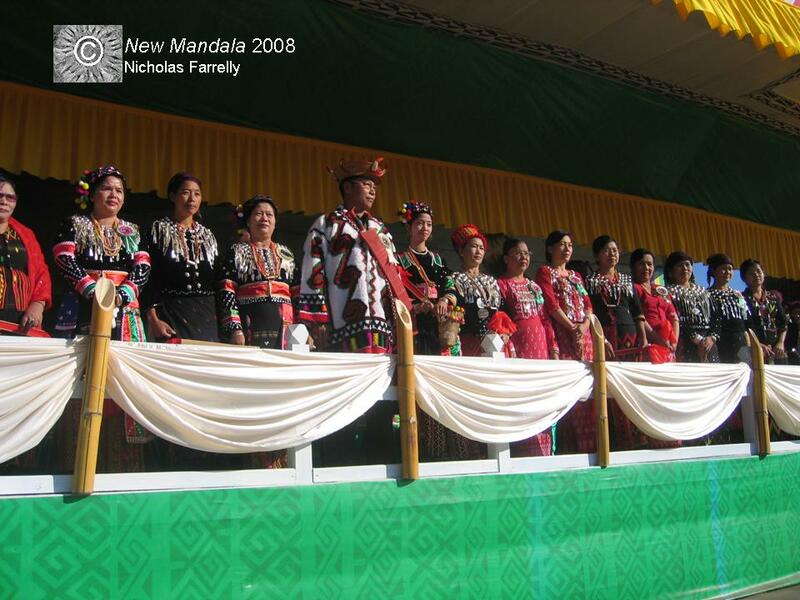 actually a “chiefly” outfit that crosses the boundaries of the various “Kachin” groups? Suggestions from readers are, as always, very welcome. The Rawang style certainly is a bit more impressive than the standard Jinghpaw style, although I’m partial to Jinghpaw style nhpye (shoulder bags). Still, I can’t help but wonder if there isn’t a political aspect to the choice of costume. After all the Rawangs are the one Kachin group that did not support the KIO, except for some individuals, and in fact there was a civil war between the KIO and the Rawangs back in the 1960s. Of course, this was a celebration of the Kachin State, so maybe it was an attempt to be inclusive of all the Kachin groups, but he could have worn Atsi, Lashi or Maru attire. Oh, and for it to be chiefly attire, I think there is supposed to be a tiger jaw attached to the scabbard. Your post and photos reminds me of the Manaw Bwe scene from that book “A Boy Soldier” I have read last year. The book was based on the period of early seventies when KIA and Burmese Army were fighting each other in a savage war. In the book, local KIA Battalion and the local Burmese Army Battalion arranged a temporary ceasefire so that the village could have a long suspended Manaw celebrations for that war-torn region right by the China border. 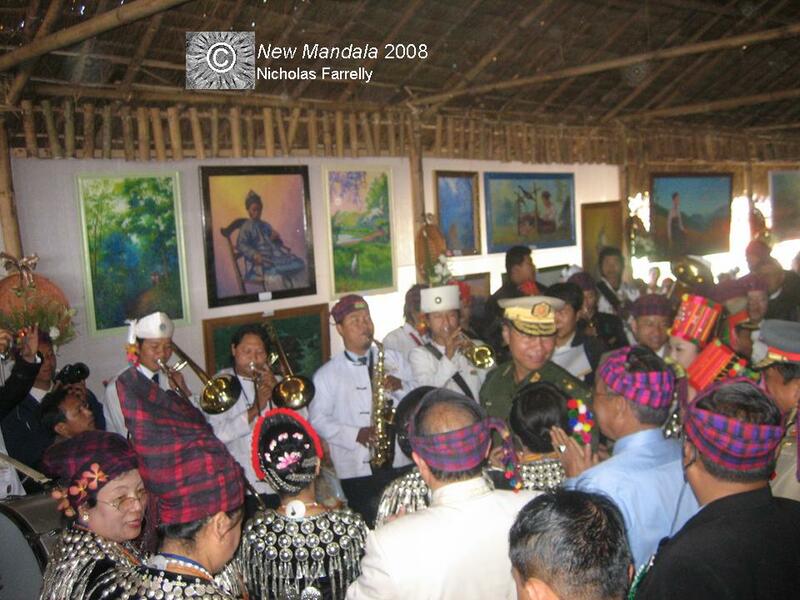 I am glad that people now have a lasting peace in Kachin State and enjoy the Manaw Festival. I hope the current ceasefire will last forever!